An update… I’ve been testing my new version of the driver, isn’t it pretty? Well, I actually do have boards, I’m just testing a bunch with this test platform before committing to building any. The new version has an improvement. With a little trickery I have converted the 256 step 10K digipot into a 768 step 30K digipot. This means I have constant current adjusting down to ~60mA instead of ~160mA. I’ve also been testing with a 50K digipot. It’s a better option if really low constant current modes are of interest, but because of the resistance range of the digipot the higher output steps are too big. One step of the 50K digipot changes over 0.4A at the top end. This prevents having a smooth ramping algorithm over the entire range. I might offer it as an option, choose between smooth ramping or really low constant current outputs with jerky horrible nasty ramping. I’ve done the same trickery with this 50K digipot and converted it into a 768 step 150K digipot, which means adjustable constant current down to about 12mA. Could that be of interest for those that prefer traditional mode change UIs because the ramping is just plain ugly. However, 150K ohm is well above max specified resistance in the datasheet (30K) so I don’t know if there is any flickering. I can’t see any but I should hook it up to an oscilloscope and check. what do you mean with digipot? I’m curious how both chips (the CN5710 and CN5711) react to PWM. Especially how they handle Fast PWM since the datasheet says that the max recommended is 2KHz. I have neither the oscilloscope nor the know-how for assessing such capability. Not sure I understand the question. With digipot I mean digital potentiometer. Of coarse. I’ve been using 10 bit PWM on 160mA with these previous versions, it works fine. I’ll use it on this new 60mA setup too. It’s just that I like to use as much CC without PWM as possible, for no other reason than to see how low I can go. Practical and usable? Maybe not, it’s just for fun. I don’t find the tint shift at these low output levels to be noticeable unless you really look for it… which I don’t. EDIT: Obviously tint shift is different depending on LED choice. I haven’t used these drivers on many different types of LEDs, I might very well notice it after more testing. I use 10 bit fast PWM on them and the transition from 160mA constant current to PWM is smooth. It looks good, but how good it is I can’t tell. We have an oscilloscope here at work, but honestly I wouldn’t be able to tell if they react good or bad to PWM because I wouldn’t really know what I’d be looking at. I can say that with 10 bit fast PWM, the lowest usable value is 5. It’s smooth increase from there up, but lower and the LED basically goes out, barely visible and no visual difference from 4 down to 1. I use 10 bit fast PWM on them and the transition from 160mA constant current to PWM is smooth. It looks good, but how good it is I can’t tell. Thanks! 2KHz just sounds bad, glad Fast PWM works. I’ll have to give that a shot when my parts come in. Development is on going… not at lightning speed exactly… Anyhow, now I’ve at least reached the stage where I can start testing all switch combos in a real light so I’ve built a dedicated test unit. Posted in the mod today thread but worth posting here too. I’ve had a L4 laying around hardly used for ages so why not give it new life as a driver firmware testing unit. My drivers are 17mm though, so I made a specific version for the L4 with integrated E-switch. As it’s bigger I can fit more regulators on it, so I now have full constant current PWM free ramping from 0.05 amps up to theoretically as high as 8.5 amps. Not sure if this is the best thread for tech questions/discussions on this driver. But if you could summarize as brief as you can the basics of CC drivers. I know there's no PWM's and therefore very efficient. But I thought heat is a problem when running at lower than max output. Also don't know whether resistance is still an enemy since it doesn't boost voltage, or does it? my priority is always 1 click ON, 1 click OFF with no delays, and press&hold for ramping. Whether ramp levels are only 2-7 or a smooth 200+ (maybe 100+) would be configurable/switchable some how. Ramp direction can be switched based on timing since the last ramp. It's important to have last level memory, but be able to override memory with easy access to lowest and highest levels. This is basically what Anduril does, based on Narsil, but we are seeing more and more commercial lights operate this way, and I like to think BLF has been an influence on this trend. Not sure if this is the best thread for tech questions/discussions on this driver. But if you could summarize as brief as you can the basics of CC drivers. I described the use of these in the OP, but in short the regulators on these drivers use current sense resistors from 1,2 K ohm and up. That’s a handy resistance value, so on one of them I use a 256 step 10K digital potentiometer instead of a fixed resistor which makes it fully adjustable. When it reaches it’s max current I turn on another regulator with fixed current and reset the adjustable one back to lowest current setting. The CN5710 is rated up to 1 amp, the larger CN5711 is rated to 1,5 amps. I’ve also “converted” the 256 step 10K digipot into a 768 step 30K digipot which makes the regulator adjustable from max down to about 0.05 ~ 0.06 amps in 768 steps. But I thought heat is a problem when running at lower than max output. Also don’t know whether resistance is still an enemy since it doesn’t boost voltage, or does it? No boost. Only current regulation. I have to ask about this. When exactly does the light turn on? As soon as you press the button? Or as soon as you release it? Currently I have short cuts from off and I don’t want the light to cycle through modes when entering the short cuts from off, so I have a very slight delay for multiple press detection. Narsil and Anduril don’t have this delay? Does that mean they don’t have multiple press short cuts from off, or they cycle through the modes when entering these shortcuts? For NarsilM, I do it on button release for both 1 click ON, and the 1 click OFF. Anduril does it differently - I think for going ON, it uses the button press, but for going OFF, she does have a noticeable delay but I believe she's trying to fix that. NarsilM will have small delays for multi click sequences, so for example: a dbl click goes to turbo, but for a triple click I don't want the user to get a blinding flash, so I delay to properly detect when the multi click sequence has ended. My earlier versions did not have that detection/delay and I got complaints. Ok, just read that post bout doing the thermal test - Wow! That's pretty cool. We'll have to see how that plays out in the real world I guess, unless you already know or you know what to expect. I don't understand everything though, bit I assume this driver will be capable of true smooth ramping? If so, could we still apply the non-linear intensity ramping TK came up with and is used in both NarsilM and Naduril? We use a python script that TK wrote to generate the tables, parameter driven. I do smooth ramping with these drivers. The actual mode values used in my firmware (and stored in eeprom) are current values in mA. For example for 3 amps the mode value is 3000. I use the current sense formula in the datasheet to calculate the digipot position and how many additional regulators need to be turned on to meet the entered current. My ramping is an algorithm that increases/decreases the LED current exponentially based on the current value, and it’s rather smooth. I haven’t settled on the final algorithm yet but it’s good enough to continue on with other things. OK, that's all cool for what sounds like a pretty good smooth ramping, maybe even better than ours because switching channels on ours isn't the greatest, least in NarsilM for a triple channel. Progress is slowly moving forward. 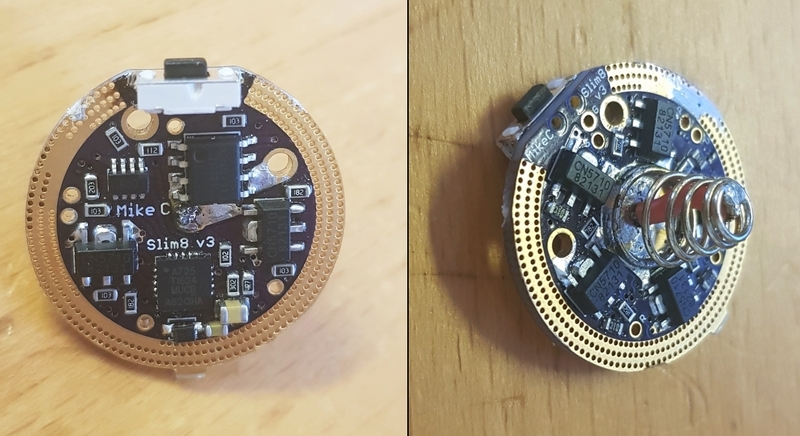 I had a break from firmware development and spent some time designing drivers, among others a driver with a micro USB port that I’ll use for flashing the driver, so no need to even unscrew the head… if it works… But that’s done and OSH Park have the ball on that project, so back to firmware again. Okidoki, I finally have basic firmware functionality including configuration system for all switch types. I can finally get down to the details some of you have posted. I hope those of you that have posted haven’t lost interest yet and can answer a few inquiries I have about some suggestions. I’ll be asking every now and then. I’ve only once had a flashlight with forward clicky and I didn’t like it at all so I’ve not used forward clicky since then. Because of that my firmware isn’t really written with forward clicky in mind. However, I’m interested to see if I can make it work. You state that with FC on guppy3drv you can double click for turbo. Does this shortcut only work from cold start? Or can you do two short offs and go to turbo at any time? I am kind of curious on how this double click short cut with clicky switches work, doesn’t it interfere with normal mode changing? If you turn the light on and want to switch modes instantly, isn’t the short cut to turbo going to kick in instead of fast mode cycle? Or dose guppy3drv assume you don’t change modes rapidly? I have support for clicky switch short cuts but having a double click short cut really interferes with normal mode changing. That’s ok if you only have three modes, but then the double click short cut is useless. ^ You have to select your mode from half press momentary. Press-press for turbo then press all the way to click. Just thinking that if the light is started in lowest mode and you want to step up only one mode brighter but not to turbo/boost, how would you do that? To me it seems the same press sequence would be used. Leave on just a little bit longer before release and press. Put more time between inputs. OFF—-Press until light (lowest)— some time—-release/press to next mode brighter—full press to click to lock on. OFF -Press until light(lowest)—quickly release/press to turbo— full press to lock on. EDIT- this is how it works for H17f. On Guppy 3drv you might have to quickly release/press 2 time for turbo. Aha, ok thanks. You basically have to wait for a “multi press detection timeout” before the next press. I have multiple off press detection, but as being a reverse clicky guy it would be fairly annoying to have to wait between off presses with a 4 to 5 mode light. Out of curiosity, do you know exactly how long the timeout is on H17f or guppy3drv? I’ve set mine to half a second. With H17f and possible guppy3drv there is no waiting on the off presses to change modes. IF you do wait you will either go back to mode memory, or reset to beginning of mode sequence. That youtube link just brings me to youtube.com, not an actual video… I used search function though, I found a few to look at. Reverse clicky— there is no waiting while off to change modes. Very brief off presses with cycle through the modes. With a forward clicky, you have wait just a bit when you first press—let the light know its on in low before you release/press to switch to med. If you press-release/press to fast on H17f (possible guppy3drv). It will read inputs as double tap and go to Turbo or what ever the double tap is. The “some time” is time on. Edit, I don’t know why video link is not working. Search—- H17F driver run down with mistakes. 1 cut Chad. That’s the wait I’m asking about. Do you know exactly how long that wait is? 1/4 second? 1/2 second? 3/4 second? 1 second? I know. What I am asking is if anyone knows how long “some time” is. I don’t have the light with me right now! Later today I will check how it behaves both with RC and FC switches and will tell you as now I have some doubts, specially when using FC clicky. I’ll try to make a video with both kind of switches and will link it! Cool, that would be awesome! It is actually very short. Here is a crappy video with me using a knife for a forward clicky. In the meantime…I’m out of the GAW. 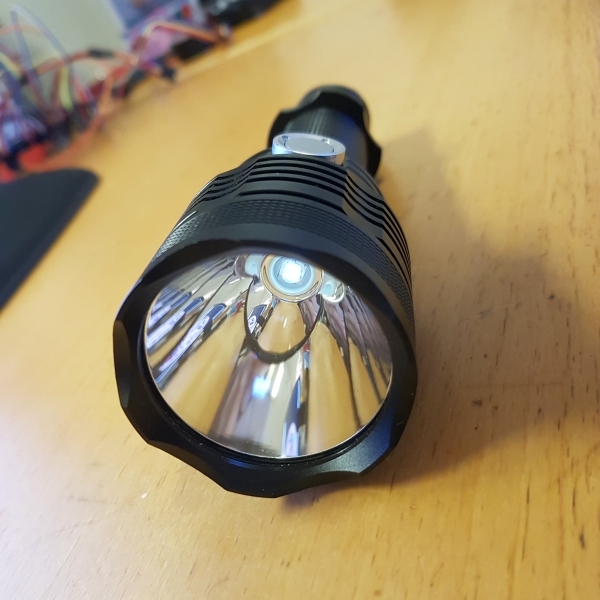 I intended to use it with White Flat in Emisar D1. This combination doesn’t work well. Now I don’t have a combination of host and LED where this driver would really shine…I waited a bit with retiring because I thought that maybe I’ll think about some good combo. Well, it didn’t happen. 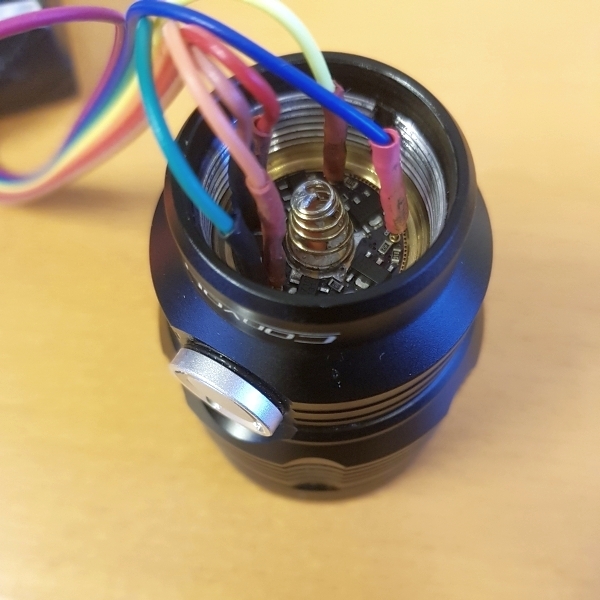 So, I picked my Convoy S2+ with the guppy3drv and made a try with Forward Clicky switch and Reverse Clicky switch. For what is worth, I am using mine in the configuration 10-5-5 (FF > 1 > 5 > 25 > Double for 100%) [ 4 modes + 100% ] and without memory activated, so it always starts in FireFly mode. e) on the mode 25 (4th regular level), if I double click for turbo and then do the “quick release>press again”, the light will restart in the FF mode, not the 25 mode. f) obviously, a full click at any time “locks” the mode I am in at the moment, so I can only do the double click for turbo when doing half presses. Then I can lock Turbo by doing a full press. f) on the mode 25 (4th regular level), if I double click for turbo and then tap the switch, the light will restart in the FF mode, not the 25 mode. Please apologize as I made mistake before the level 25 (4th) so I’ve restarted from there again. This is curious, I had never tried this, but despite the switches used, they will behave similarly. All and all, in the 4th level, it doesn’t get back to it after Turbo, it will always go for FF. I must mention that I didn’t use lighted switches, as they may have influence in the driver behaviour. I hope this was useful and gives you some input on this UI! As I mentioned, please be aware of the configuration I am using (10-5-5) and no memory. Thanks for those videos! And chadvone too. I find it a little odd that the behavior is different on the 4th level mode. Is this by design and something you appreciate, or would you rather have it go back to 4th regular level after quick tap from turbo? Also a question about timing, using RC video for reference. At about 0:07 to 0:16 you do regular mode switching. Then at 0:17 you do double tap for turbo. Is it specified anywhere what the time limit between presses is? Obviously if you do two presses directly after each other with for example 0.1 second interval the light will switch to turbo, but if you do two presses with two second interval the light just switches mode after each press. What is the time limit where two presses are either identified as double tab for turbo or identified as two simple mode switch presses? I think this is the critical part weather my UI will work for you or not. The rest is easy, I support most of it as it is already, but the timing between presses is something that one gets used to. If it’s wrong on another driver it just gets annoying. Thanks Mike! Well, all that is happening is by design, meaning that I didn’t program anything in the driver. This is a DrJones firmware in a MTN Electronics driver. I only noticed that “odd” situation when I tested it last friday with both types of clicky switches. For my taste, I would rather have it to go back to the 4th level, instead going to FF after turbo. I’d find it more consistent and standardized! However, I think this is a thing that also happens in some other flashlights (ex: Olight M2R Warrior, where after Turbo, a press&hold takes us to Low mode instead of the last used mode). Also a question about timing, using RC video for reference. At about 0:07 to 0:16 you do regular mode switching. Then at 0:17 you do double tap for turbo. Is it specified anywhere what the time limit between presses is? I didn’t find any specification about that time limit in the pages where I saw the UI Normally it juts says “double tap”. Obviously if you do two presses directly after each other with for example 0.1 second interval the light will switch to turbo, but if you do two presses with two second interval the light just switches mode after each press. Yup, that is correct. I cannot measure that accurately, but a longer interval between presses will switch mode. Still, there is a time interval in which we can double tap to turbo, so it may be slightly bigger than 0.1s. Meaning that sometimes I take bit longer to do the second press and it will still lead me to turbo. If I can, tonight I may try to do a video exemplifying those small differences. What is the time limit where two presses are either identified as double tab for turbo or identified as two simple mode switch presses? I think this is the critical part weather my UI will work for you or not. The rest is easy, I support most of it as it is already, but the timing between presses is something that one gets used to. If it’s wrong on another driver it just gets annoying. I’ll try to show this on the video, so that you can make a more “appropriate guess” or a rough estimation of the time needed for those presses. You prefer the demonstration with RC or FC or both, Mike? Thanks Mike! Well, all that is happening is by design, meaning that I didn’t program anything in the driver. I know you didn’t program it, but by design I mean if it’s intentional. To me it looks more like an unintentional feature, in other words a bug. But I guess Dr Jones is the only one who can really answer that. In either case it doesn’t make sense to me so I won’t implement it. My firmware switches back to last used mode regardless of which mode that is. I only need to see one, and which one is not important so what ever is easiest for you. I’ll take a stab at guessing it’s half a second, meaning two taps with on time between taps under half a second will register as double tap (turbo), and two taps with over half a second on time between taps will just do regular mode switch. Oh, sorry, I didn’t understand it well at first!! Yup, seems like “bug” as it doesn’t make many sense to jump to FF after turbo on that level. Anyway, like you say, it doesn’t make much sense to me either. But, as I normally use it with the FC switch, I don’t tend to go to the 4th level and to turbo from there. If I used it with RC switch, I’m sure I would bother more about that, as I like to return to the previous used mode.